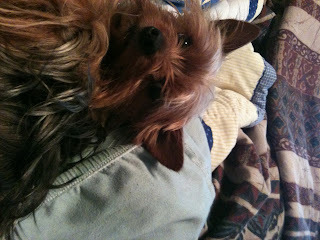 My adorable 3lb miniature yorkie. He goes by Scout, Lickity, Lickity Lou, Lou, Scouter, Scavenger and several other names. He was adopted by the hubs and I in 2009, after we bought our home. He was Born January 3rd, 2008. The first family he was with couldn't handle a hyper puppy with their old dog, so he was passed along, the next family was abusive, very badly. Then he was brought to my parent's who have 2 other yorkies and a chihuahua. There he learned what it was like to be the only boy dog, what it was like to have "sisters". He learned what it was like to be loved, to have food whenever he needed it. He slept in a bed with someone. He learned what love was. In June 2009, my parent's were having a hard time handling the hyper little puppy, who liked to run away, got in fights with the other puppies and just was over all being a naughty puppy. We took him in. He is the only dog in our home. He was our baby before Miss A. He is now house trained and is a lot calmer, though he rarely allows for his hair to be cut, his nails never, and he does have a barking problem. He's much better. He's relaxed. I think he knows he is home. He might still have emotional problems from being abused, making him very jumpy and a little strange, but we love him. He loves us, he loves A. He's often found snuggling by her when she's napping. He also enjoys laying in the sun in her room while she reads to him. I'm yet to get a picture of it but it's adorable.